Click on a picture to see media and size choices and to preview the picture on a wall in your home. Skyline Art Prints is the printer that will print and mail your order to you. You will notified by email when you place an order and when your order ships (tracking number included). Most prints are finished in 3-4 days or fewer however some media take longer; express prints are finished and shipped in 1 day. For more information about shipping, see Skyline Art Prints shipping webpage. Some originals are available -- contact me (teresa@teresaespaniola.com). Dinghy parking in San Diego Bay appears to be a bit chaotic, yet there is harmony and beauty in this peaceful spot, as if dinghies are OK with roommates. The San Diego skyline has several different looks, depending on where you are on the waterfront. The view from Coronado is pretty straight across, yet the view as you sail into the harbor is quite different, as if the city were built to show itself off to all mariners as the arrive. 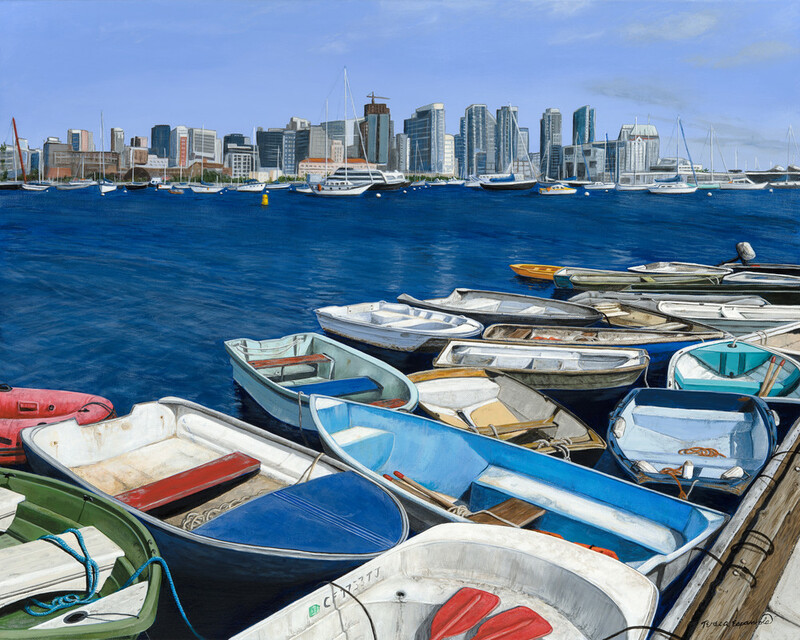 The view in this painting is from the Northern side of the Embarcadero, farthest from the Midway, past the docked museum sailing ships and submarines, past the Hornblower cruisers and the net and lobster trap dock. I consider it a sweet spot on the bay, as I love the look of all of these dirty dinghies and the way they are bunched together like sardines. It is actually quite peaceful to sit here for a moment and watch the way they move together as one from the slight ripples and boat wakes in the bay. Mindscapes © Copyright 2015-19, Teresa Espaniola. All Rights Reserved.